If you want to improve the condition of your floor, you can take advantage of our floor sanding services. Our staff will remove all imperfections and signs of aging from your cork, parquet, softwood and hardwood floors. They know how to make your floors impeccable and prolong their lifespan. Use our services to make your floors much more resistant, looking better and serve you long time. 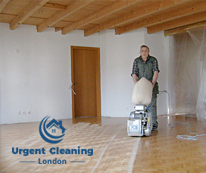 Our floor sanding is at your disposal within London seven days in the week at affordable rates. Order it by chatting with out customer care operators, using our online form or by calling us. Our specialists will check the condition of the floor to estimate what needs to be done. If there are cracks and damaged areas, they will provide the necessary restoration of the boards and planks. Our technicians will move all items and pieces of furniture which are on the floor area. Then, they will take out the nails and tacks they find from the floor to protect the machines and the floor from damaging. After completing the restoration of the floor, our technicians will provide the necessary sanding and sealing. 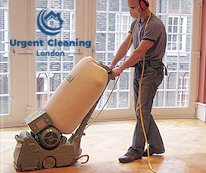 Our company is located in London where we provide our professional floor sanding services. The floor will be sanded with a few grades of sanding equipment starting with the most coarse-grade and finishing with fine-textured sandpaper. Our experts use dust removing equipment to keep the floor clean while they work. After the floorboards and planks become smooth and well levelled, our technicians will seal them. They will cover the floor with a couple of layers of varnishes, oils or wax. They will ensure the better resistance and excellent condition of your floor coverings.